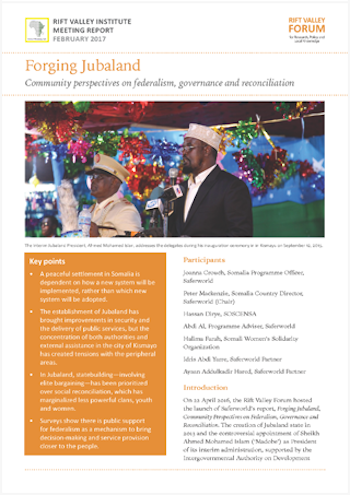 On 22 April 2016, the Rift Valley Forum hosted the launch of Saferworld’s report, Forging Jubaland, Community Perspectives on Federalism, Governance and Reconciliation. The creation of Jubaland state in 2013 and the controversial appointment of Sheikh Ahmed Mohamed Islam (‘Madobe’) as President of its interim administration, supported by the Intergovernmental Authority on Development (IGAD), precipitated tensions and divisions in Somalia. In response, the Saferworld team in partnership with the the South Central Non- State Actors forum (SOSCENSA), conducted a quantitative and qualitative study in the regions of Dollow, Garbaharray, Belet Hawo, Afmadow, Baadhaade, as well as among IDPs in Mogadishu and Kismayo. The study, funded by the European Union (EU), was conducted over a two-year period and sought to find out to what extent federalism is meeting the governance and reconciliation needs of the population.